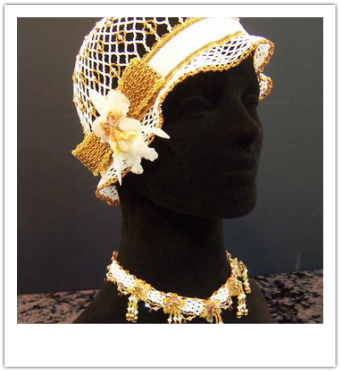 At the Bead & Button Show last June bead manufacturer Toho had kits available for a challenge. The beads in the kit were 8mm dark bronze rounds, 6mm dark bronze quadratiles, 3/10mm matte dark bronze daggers, 6mm chartreuse triangles, 8 seed beads bronze AB, 11 seed beads bronze, 15 seed beads bronze, Aiko bronze seed beads, 8 seed beads dark chartreuse, 11 seed beads dark chartreuse, 8 seed beads matte turquoise, 11 seed beads matte turquoise, 11 seed beads dark blue rainbow, 15 seed beads dark green metallic, and 3mm magatama. You could make anything you wanted but you could not add other beads except a focal. Several of our members participated in the challenge. They include Laura Andrews, Julie Fletcher, Becky Pancake, Cheryl Erickson, Nancy Miller, Roberta Sorensen, and Betty Ekeberg. I found it very interesting how different all of our pieces turned out. Here are some of the submitted pieces from our UMBS group! Congratulations to UMBS Member Rebecca Bechel! 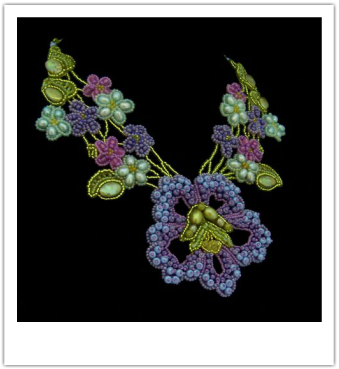 Grand Prize President's Award for her Chandelier titled, "Butterfly Falls", with SWAROVSKI ELEMENTS, Seed Beads and Wirework. Has a lot to brag about, Congrats! 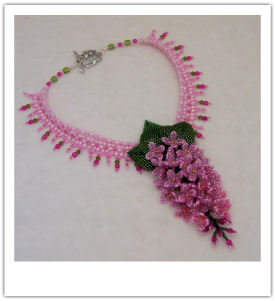 ​"Picnic in May on Lilac Way"
The winner of the Second Place ribbon in the Seed Beed category of the Bead Dreams competition at the Bead & Button Show in Milwaukee, June 2013. I am so very excited to announce that I have been invited to participate in the Minnesota State Fair Fine Arts "Studio: HERE" program this year! In this curated exhibit, a practicing Minnesota artist is installed in a small studio space in the middle of the gallery show, to providing a window into the WORK of creating art. The fair runs 12 days, and 12 artists (one for each day) from a range of disciplines are invited to spend 12 hours, working and interacting with gallery visitors. My day in the Fine Arts gallery is Friday August 30th from 9a.m. to 9 p.m. Stop by to say hello. Wear your UMBS shirt if you have one, and help me move forward my personal mission to make sure that there is room for bead art in the beautiful Fine Arts Gallery each year. She did not win a ribbon - but this piece was sold at the opening preview night. 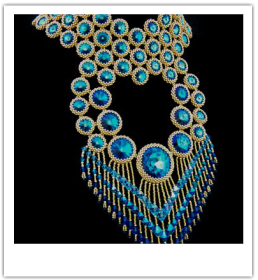 One of three pieces selected to be included in the new Lark book: "Showcase 500 Beaded Jewelry"
We have purchased this book for the UMBS library. "Battle of the Beadsmith" competition. Her piece has made the first cut - watch for an update to see if she wins! September 10 update- she did not make the finals - but we are proud of her for participating! Yea Marsha!! UMBS Member wins Quilting Award! Many UMBS members are also involved in other crafts, but how many of us have ever had our name printed on a T-Shirt that tells what award you have won? Minnesota Quilters have chosen Maxine Rosenthal as the Quilter of Year for 2012. Maxine is the author of 'One Block Wonders', and has also co-authored 'One Block Wonders - Encore' and 'One Block Wonders - Cubed'. These books give an assortment of ideas for making kaleidoscopic quilts. UMBS member Maxine Rosenthal proudly wears the T-Shirt pictured at the right. Maxine Rosenthal 2012 Quilter of the Year. Minnesota Quilters, Inc and shows a portion of the quilt pictured above. This t-shirt was presented to Maxine at the annual Minnesota Quilters Show held in Rochester, MN.